*-Waves- I'm back!!! Many thanks to my wonderful guest posters last week while I was away! Today, I have another amazing polish from the summer Orly Baked collection. This has hands down been my favorite mainstream collection of summer. Orly did an amazing job with this collection. This next one is definitely a favorite. Hot Tropics is a bright orchid with an intense shimmer. Color: This is a beautiful purple-pink shade. My problem is my camera couldn't capture this richness of this color. I will say this a little more purple than is shown in the photo. 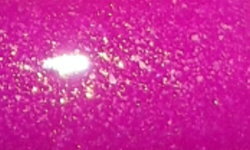 I love this bright color, and the shimmer is the really winning point of this polish. Formula: Excellent easy to use formula. I used 2 coats above. Price: I paid around $7-$8 for this at Sally's Beauty Supply. Overall: This is another stunner from the Baked collection. The shimmer in these bright/neon polishes really are a beautiful addition and done right. I highly recommend Hot Tropics. I don't think anyone could go wrong with it. My only complaint, my camera couldn't capture just how awesome it is! This is so pretty! I wasn't excited about them from the promo pics, but swatches are proving me wrong! Beautiful color! I must say, Orly knocked it out of the park with this collection! This is one of my favorites from the Baked collection! That is one pretty color! Lovely swatch of it too. Welcome back! Hope you had a great vacation :D I totally need the Baked Collection O.O this color looks great on you!